House Concurrent Resolution 55, by state Representative Ron Reynolds, D-Missouri City, would direct the State Preservation Board to mount a plaque in the Capitol acknowledging that the building was built through a system in which state prisoners were leased to private companies and forced to do manual labor for no pay. The resolution asks that the new plaque replace the recently removed Children of the Confederacy plaque, which wrongly claims that the Civil War’s main cause was not slavery. But the resolution is non-binding. If it passes, the State Preservation Board, headed by Governor Greg Abbott, can simply ignore it. A second resolution, HCR 51, also filed by Reynolds, would call for an interim committee to study the history and “lingering effects” of the convict leasing system in Texas. 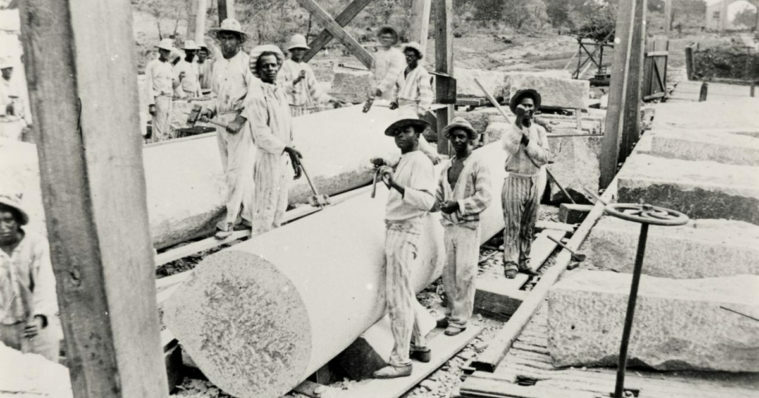 The system emerged from a loophole in the 13th Amendment, which abolished slavery and forced labor in 1865 but allowed for new slavery-like systems to flourish. Southern lawmakers soon passed laws known as “Black Codes” that targeted African-Americans and imposed prison sentences for petty crimes such as loitering, breaking curfew and not carrying proof of employment. State prison systems then leased out inmates to work in private iron foundries, quarries, factories and farms, earning significant profits for the state and the companies that rented the prisoners. Activists from the Convict Leasing and Labor Project and the National Black United Front testified in favor of the proposals on Monday before the House Administration Committee. “Enslaved or not, victim of convict leasing or not, if your family built a building of this great detail and this strength, wouldn’t you want people walking into this building to know that?” testified Swatara Olushola, a member of the Houston chapter of the National Black United Front, which works to combat systemic oppression of black people. Reginald Moore, who founded the Texas Convict Leasing and Labor Project, asked lawmakers to consider more than a plaque. “We need to have a committee and a study, we need to change the textbooks, we need a formal apology by the state, along with some kind of restitution and acknowledgment, like we did with the Jewish Holocaust,” he said. Moore has been asking local officials in southeast Texas to acknowledge the history of convict leasing in the area since 2003. But the discovery of an unmarked grave that contained the remains of 95 African Americans believed to have been convict laborers last year near Sugar Land brought the issue to the forefront and sparked national outrage. The remains were found on the former Imperial Sugar Company State Prison Farm after the Fort Bend Independent School District started construction of a technical center on the site in June 2018. Historians have called convict leasing “slavery by a different name,” not only because the prisoners were forced to work without pay, but because of the horrific conditions in which they worked. Moore told the House committee that the remains of the Sugar Land 95 further proved that convict laborers were exposed to inhumane treatment similar to slavery. “Their bones were bent. Their muscles were pulled away from the bones. There were gunshots through the ones who tried to escape,” Moore said. The state made “several hundred thousand dollars,” which would amount to millions of dollars today, from the convict leasing program from 1877 to 1883, according to the Texas State Historical Association. And that’s just five years of profits from the program. Texas legislators formally ended the practice of leasing state prisoners to private companies by outlawing it in a special session in 1910, but continued to force prisoners to work without pay on prison-owned farms and factories — a practice which still goes on today. Texas is one of just five states that continues to force inmates to work for no pay. Committee Chair Charlie Geren, R-Fort Worth, thanked the advocates and said their testimony was “moving” and “enlightening,” but did not state his position on the measure, which was left pending. Reynolds has also filed a resolution that directs the Texas Historical Commission to identify and pay reparations to the descendents of the Sugar Land 95. While he doesn’t expect the resolution, which has not had a hearing yet, to pass, he said it’s important nonetheless. “This call for reparations is a symbolic gesture to bring some recognition and justice for a really dark part of Texas history,” he said.